on SouledOut.org are reproduced with the permission of Lucis Trust, copyrightholder; emphasis is added. Within the sacred Council Chamber, the great Presiding One revealed unto the Teacher the Will of What Must Be. "Lost he is, and found; dead, yet vibrant with Life. The server becomes the saviour, and homeward turns." The Teacher pondered; then he called for Hercules. "Before the last gate now you stand," the Teacher said, "One labor yet remains before the circle is complete, and liberation is attained. Proceed to that dark place called Erytheia where Great Illusion is enthroned where Geryon, the monster of three heads, three bodies and six hands, is lord and king. Unlawfully he holds a herd of dark red cattle. From Erytheia to our Sacred City must you drive this herd. Beware of Eurytion, the shepherd, and his two-headed dog, Orthrus." He paused. "One caution I can give," he added slowly. "Invoke the aid of Helius." Through Gate the Twelfth the son of man who was also the Son of God departed. In search of Geryon he went. Within a temple Hercules made offerings to Helius, the god of fire in the sun. For seven days he meditated, and then a favor was bestowed on him. A golden chalice fell upon the ground before his feet. He knew within himself that this bright object would enable him to cross the seas to reach the land of Erytheia. And so it was. Within the safe protection of the golden chalice, he sailed across the tossing seas until he came to Erytheia. Upon a strand in that far country, Hercules debarked. Not long thereafter he came upon the pasture land where the red-hued cattle grazed. Guarded were they by the shepherd Eurytion and the double-headed dog, Orthrus. When Hercules approached, the dog sped forward like an arrow to its target. Upon the visitor the creature hurled itself, snarling viciously, its bared fangs fiercely snapping. With one decisive blow did Hercules lay the monster low.Then Eurytion, fearful of the brave warrior who stood before him, supplicated that his life be spared. Hercules conceded his request. Driving the blood-red cattle before him, Hercules turned his face toward the Sacred City. Not far had he gone when he perceived a distant cloud of dust that rapidly grew larger. Surmising that the monster Geryon had come in mad pursuit, he turned to face his foe. Soon Geryon and Hercules stood face to face. Breathing fire and flame from all three heads at once, the monster came upon him. 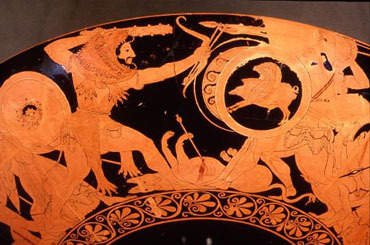 Geryon hurled a spear at Hercules that almost hit its mark. Stepping agilely aside, Hercules evaded the deadly shaft. Stretching taut his bow, Hercules let fly an arrow that seemed to burn the air as he released it, and struck the monster squarely in the side. With such great impetus had it been shot that all three bodies of fierce Geryon were pierced. With a shrill, despairing groan, the monster swayed, then fell, nevermore to rise. Toward the Sacred City, then, Hercules drove the sleek, red cattle. Difficult was the task. Again and yet again some cattle strayed, and Hercules would leave the herd in search of errant wanderers. Across the Alps he drove his cattle, and into Italy. Wherever wrong had triumphed he dealt the powers of evil a deadly blow, and righted the balance in favor of justice. When Eryx the wrestler challenged him, Hercules cast him down so forcefully that there he stayed. Again, when the giant Alcyoneus threw a rock that weighed a ton at Hercules, the latter caught it on his club, and hurled it back to kill the one who sent it forth. At times he lost his way, but always Hercules turned back, retraced his steps, and journeyed on. Though wearied by this most exacting labor, Hercules at last returned. The Teacher awaited his coming. "Welcome, O Son of God who is also a son of man," he greeted the returning warrior. "The jewel of immortality is yours. By these twelve labors have you overcome the human, and put on the divine. Home have you come, no more to leave. Upon the starry firmament your name shall be inscribed, a symbol to the struggling sons of men of their immortal destiny. The human labors ended, your cosmic tasks begin." From out the Council Chamber came a voice that said, "well done, O Son of God." There are several variations of the myth concerning the labor of Hercules in the sign Pisces. We are told that there was an island where lived a human monster called Geryon with a body of three men united. He had a herd of red cattle, guarded by a shepherd and a two-headed dog. Hercules received orders (Pisces is the sign of obedience) to bring these cattle from the island, across land and water to the sacred city. Hercules sailed to the island in a golden cup and when he arrived there he climbed to the top of a mountain and spent the night in prayer. Then he killed the two-headed dog but he did not kill the shepherd. He also killed the owner of the red cattle. Here is the beautiful part of the story: Hercules placed all of the cattle in the golden cup, in which he had sailed over to the island, took them to the Sacred City, and offered them in sacrifice to Athena, Goddess of Wisdom. This sacred city consisted of two towns connected by a wonderful wall and a gateway called the Gateway of the Lion. After the cattle were delivered Hercules' work was over. We hear no more about him but he may have gone on to greater cosmic work. Let us think of Hercules as a world saviour. He has had a vision of something he has to do. He sees humanity owned by a monster, a three-bodied man, the symbol of a human being with mental, emotional and physical bodies united. I think that this labor has not yet been completed; this accomplishment lies ahead. There have been other sons of men gathered out of the human family from time to time, one here one there, a group here and another there, as when the Buddha was on earth and it is said that he saved nine hundred. Now humanity, the human monster, is ready for salvation and the real work of The World Saviour can begin as a whole with the group concept underlying the work rather than individual soul saving. The symbolism of the red cattle is plainly that of the lower desires, desire being ever an outstanding characteristic of humanity. They are guarded by a shepherd, which is the mind, the two-headed dog representing the matter aspect and the psychic nature. You see why Hercules spared the shepherd. The mind can still be the shepherd of the cattle but the two-headed dog, the psychic-emotional nature and the matter aspect, Hercules killed, which means that they were deprived of any power. The shepherd still had power and I can conceive of no time in which a human being in incarnation will not need to use the mind as the interpreter of spiritual energy. If Jesus as a human being, en rapport with his soul, becomes a transmitter of light to the sons of men, so we can extend the concept and think of humanity as a whole with all minds held steady in the light, transmitting to lower kingdoms in nature that spiritual energy which will raise them up into heaven. That is the work of humanity. We are so occupied with our own problems that we forget the larger picture. It is to be noted again that the keeper of the cattle, the form aspect, was also killed but the shepherd and the cattle were raised up in the golden cup. Here you have the Holy Grail; and so the work was accomplished. The World Saviour had fulfiled his function. He had lifted up humanity. That is what all world saviours have done. They all did what, to a greater extent, Christ did. We hear about the failure of Christianity. I do not see failure anywhere in the Great Plan. Perhaps slowness, but do you know how disastrous it would be if evolution were too rapid, how dangerous it would be if people were over-stimulated before they were ready? All teachers know the dangers of over-stimulation, the disasters that occur when a person makes certain contacts before the mechanism is sufficiently tuned up. World saviours have to work slowly, but time means nothing to them. The term, world saviour, has until now been associated with the thought of the emergence of a great son of God out of the Father's home, called by the need of humanity to do a great work. Down the ages they have come, dwelt in physical bodies, worked through an emotional nature and have been exceedingly intelligent. They have by their lives set an example that we may follow in their steps; by their words they have sounded the note, the message that humanity needed in order to take the immediate next step forward. In their acts they have given a demonstration of service, gone about the world doing good, and their names have stayed with us down the ages. You must be a very dominant figure to remain in the minds of men for thousands of years. Most of us are forgotten in twenty. The sign Pisces marks a triangular place in the heavens, a symbol of reality. This sign rules the feet and hence the idea of treading the Path and attaining the goal has been the underlying spiritual revelation of the Piscean age. Pisces is also the sign of death in various aspects. The death of the body sometimes, or it may be that an old foolishness has come to an end, an undesirable friendship will cease, devotion to some religious form of thought that has held you will now end and you will emerge and set your feet upon a new path. It is the sign of death to the personality. If we could give up the idea of the personality veils, we would be willing to let the personality go. It also means the death of a world saviour for it is the sign of crucifixion and marks the end of a zodiacal cycle. There are three signs of salvation in the Zodiac. First, Leo, where the word goes out to the human being, "work out your own salvation". So we have in Leo the man determined to stand on his own legs, he becomes bumptious and assertive but this is necessary to salvation because only by trying out his equipment will he arrive at the point where a broader view appears. The second sign of salvation is Sagittarius, the sign of service and silence, where the assertive man, tired of talking of himself and pushing himself forward, loses sight of himself in the goal and silently serves. Then we come to the third sign Pisces, that of world saviours. The first constellation in Pisces is that curious cluster of stars called "The Band", connecting the two fishes, one fish headed straight to the north and the other swimming on the horizon. The fish headed toward the north is the symbol of the aspirant to the mysteries while the fish on the horizon represents the average person. The second constellation is Andromeda, the chained woman. We have three women among the constellations, Cassiopeia in Aries representing matter seated in her chair, dominant; Coma Berenices in Virgo who sacrificed her hair to be of service, representing the soul only beginning to assert itself. Andromeda, the chained woman in Pisces represents matter harnessed. The third constellation in Pisces is the King named Cepheus, the husband of Cassiopeia and the father of Andromeda. This suggests that "The King" represents the Spirit or Father aspect. There is in nature the human kingdom and above it are other kingdoms, spiritual and cosmic, and below it there are the animal, vegetable and mineral kingdoms. The work of the intelligent sons of God is to act as transmitters, via the mind, of spiritual energy, which will save and vitalize all lower kingdoms of nature. How can the World Saviour come? He might come as he came before, in a physical body with its incidental handicaps. There are emerging in the world today new faculties that were not demonstrating when he came before. We are much more sensitive than we ever were; we are wide open to each other's thoughts for one thing, and if such a potent thinker as the Christ, whatever we may mean by that word, is en rapport with world affairs, it seems to me he might try another method. He may work with his own in every land, over-shadowing his disciples wherever they are found, and because his soul and their souls are one, communicate to them the Plan, indicate to them the tendencies, give them the new message, and repeat himself in every country. It is already happening today. in every country there are to be found those who know; I did not say those who say they know. But there is a group of human beings, integrating now, who make no noise, are not interested in themselves, but upon whom is laid the burden of leading humanity. They are starting movements that have in them the new vibration, they are saying things that are universal in their tone, they are enunciating principles that are cosmic, they are inclusive and not exclusive, they do not care what terminology a man uses; they insist that a man shall keep his own inner structure of truth to himself and not impose it on any one else, they recognize each other wherever they meet, they speak a universal language, they demonstrate the universal light, they are servers and they have no interest in themselves. I am convinced that no individual World Saviour, utilizing a physical body, will come to us. I believe in that individual World Saviour, but I believe that he will save the world through the group. I believe that he will work through his own; that he is training people now so that the day will come when this group will be so potent through its silent meditation and the force of its world service, that it will be recognized as the Saviour; but not in our day. When A.A.B. made this statement in 1936 it appears to have been the ashramic view that the status of humanity would not permit more than an over-shadowing by the Christ. When The Reappearance of the Christ, dictated by the Tibetan, appeared in 1948, the discipline of the war, the destruction of material values, the suffering and the mental growth of humanity had produced an effect which we are told exceeded the expectations of the Hierarchy. In the book on the reappearance the following statements are found: "The point of decision, as it is called in all hierarchical circles, was reached during the period the Full Moon of June 1936 and the Full Moon of June 1945. The point of decision covered, therefore, nine years, a relatively brief time; it resulted in the decision arrived at by the Christ to reappear or return to visible presence on Earth as soon as possible and considerably earlier than had been planned." It is indeed a momentous thing to realize that humanity could so notably affect the time and manner of the reappearance of the Christ by a change in its receptivity. We have repeatedly been told that only humanity could condition these points. Here is a dramatic instance of humanity's potential and responsibility in speeding up the evolutionary process. Such a group as has just been described already exists. There are two things for us to do. First, to learn to recognize the new note as it comes from disciples wherever found and, secondly, to fit ourselves to form part of that group. The hallmark of those people is not self-assertiveness; they are too busy doing salvage work to have time to talk about themselves. They work through meditation, which keeps them in touch with the spirituality that is themselves, and therefore is in touch with the Great Life, the World Saviour, who pours his force and energy through them and toward the world. They orient their minds in that direction, serve intelligently and are not in a hurry. The message that comes to them from the inner side is couched in the symbolic words, "What I tell you in the dark, that speak you in the light." Each one will be told a different thing according to the need of the people around him, and will deliberately go into the dark in order to deliver a message in the light. Therefore, they are tied by no dogmas or doctrines because they have the word which has come to them in the dark, which they have wrought out for themselves in the strife and stress of their own souls. They meet the need of their fellow men, and theirs is the message of Christ, "A new commandment I give you that you love one another." This is no sentiment. Let us be loving and kind. That is just decent behavior; but the love the Christ enunciated is an intelligent understanding and appreciation of the need of the individual just as you find him. When you are up against the desperate need of people you have no time to think about "being loving" in the usual sense. You can perhaps create such an atmosphere around yourself that they will think themselves through to their own solution. That is the real way to work. As long as you are occupied with being loving you are occupied with your own personality. "A new commandment I give you" can be summed up in "inclusiveness", the hallmark of the New Age, the universal spirit, identification, oneness with all your fellowmen. That is love and it will keep you busy; you will have no time to talk about love, you will be busy doing things, big things and little things, unimportant and important things. How shall we fit ourselves to meet that requirement, to possess those characteristics which automatically put us into the group of world servers? You will never get there by talking about it, or by theoretical appreciation of the problem. You will get there by doing the next thing correctly. That sounds very uninteresting, but whatever is your duty, do it. Cultivate the right inner attitude and be wide open to all your fellow men. Learn to meditate, and really learn to meditate. I am not talking of entering into the silence, of sitting down and having a blissful and peaceful time emoting, hoping that you will get up feeling better. Meditation when rightly carried forward is hard mental work for it means orienting the mind to the soul, and you cannot do it. It means that when you have learned to focus your mind on the soul you must hold it steady, which you cannot do; and when you have learned to do that you must learn to listen in your mind to what the soul is telling you, and that you cannot do. Then you must learn to take what the soul has told you and form it into words and phrases and throw it down into your waiting brain. That is meditation, and it is by following that process that you will become a world server for you will then be the force of what you have accomplished. You will automatically find yourself over-shadowed by that Great One whose mission it is to lift humanity out of darkness into light, from the unreal into the real. Lecture by A.A.B. - 1936. Edited and condensed. It is interesting to note that during the time we say the Sun is in Aries, from approximately March 20 to April 19, due to the precession of the equinoxes, and from the Earth's perspective, the Sun is actually traversing the zodiacal sign Pisces. With this consideration, we invite you to review the SouledOut.org materials on Pisces freshly, from this perspective.